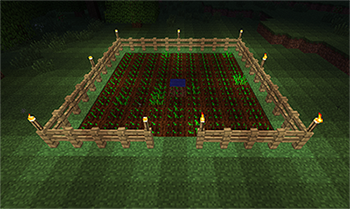 In the popular game Minecraft there is an option not only to fight monsters and break blocks, but also become a real farmer. As in life, there are different types of plants, caring for special rules. 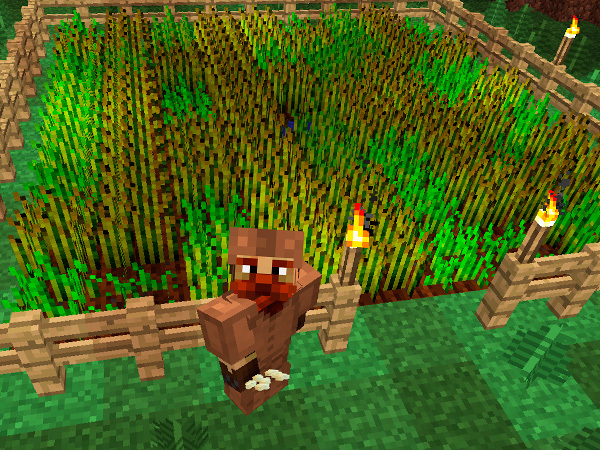 Learn how to grow in Minecraft wheat, melons, pumpkins and cocoa beans. Usually all make a trough with water in the normal way. Next plowed land and planted it. 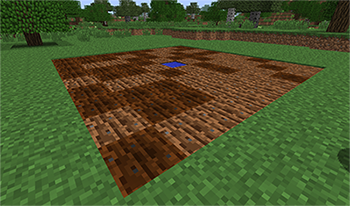 Thus, it is possible to grow in Minecraft different seeds, but it is not effective. As one unit with the water feeds around 80 blocks of land. Therefore, for wheat, potatoes and carrots will fit the bed as we have in the image. First, make a hole, fill it with water and plow for 4 blocks diagonally. Then plough all the land nearby to make a smooth square. 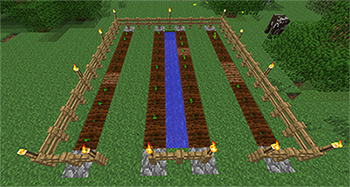 That's how much wheat, potatoes or carrots you can grow in Minecraft from just one bucket of water. It is also worth noting that if you hold down the Shift key on the keyboard, then you can safely walk on the garden beds, not afraid to break them. Now it's time to take care of the protection and coverage of our beds. 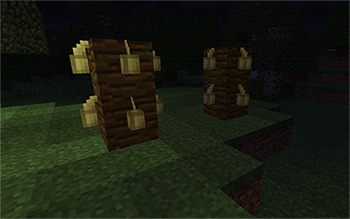 Build around a wooden fence and put on the corners and in the middle, a torch. This will be enough to grow in Minecraft plants. Turns out most effectively and beautifully. You only have to put the gate and you can wait for the harvest. Farm melons and pumpkins is done as follows. It is better not to move away from the idea of the chute. Pumpkins or melons are able to germinate even on the block, which are not plowed, but do not germinate on the rocks or used blocks, do not grow diagonally. 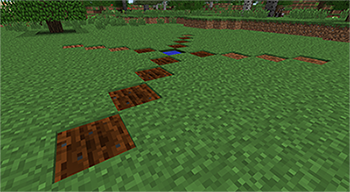 So make the bed like the picture, the stone blocks at the beginning of each patch will make it possible to receive plants that is on the side. Don't forget to make the indentation in the two blocks between the beds. Put a fence with lighting and gate. Easiest to grow is probably cocoa seeds. Take and scheme two palm trunk, placed them cocoa beans and wait for the harvest. Here, perhaps, and all about how to grow in Minecraft different plants. Now you can die in this game universe from hunger will not be possible.